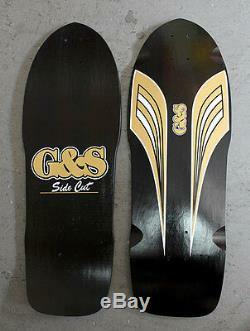 G&S SideCut Reissue from the mid-80s in black. Does not come with Griptape. Dimensions: 30" x 10 1/4" x 17 1/4 Wheel Base. TRUCK HOLES ARE THE OLD SCHOOL LARGER PATTERN. The item "G&S Sidecut black RE-ISSUE Deck old school" is in sale since Saturday, February 13, 2016. This item is in the category "Sporting Goods\Skateboarding\Decks". 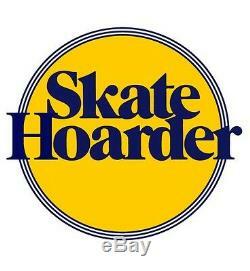 The seller is "skatehoarder" and is located in Barnstaple. This item can be shipped to United Kingdom, Austria, Belgium, Bulgaria, Croatia, Cyprus, Czech republic, Denmark, Estonia, Finland, France, Germany, Greece, Hungary, Ireland, Italy, Latvia, Lithuania, Luxembourg, Malta, Netherlands, Poland, Portugal, Romania, Slovakia, Slovenia, Spain, Sweden, Australia, United States, Canada, Brazil, Japan, New Zealand, China, Israel, Hong Kong, Norway, Malaysia, Singapore, South Korea, Taiwan, Thailand, Chile, Antigua and barbuda, Indonesia, Mexico, Bangladesh, Belize, Bermuda, Bolivia, Barbados, Brunei darussalam, Cayman islands, Dominica, Ecuador, Egypt, Guernsey, Gibraltar, Guadeloupe, Grenada, French guiana, Iceland, Jersey, Jordan, Cambodia, Saint kitts and nevis, Saint lucia, Liechtenstein, Sri lanka, Macao, Monaco, Maldives, Montserrat, Martinique, Nicaragua, Oman, Pakistan, Paraguay, Reunion, Turks and caicos islands, Aruba, Saudi arabia, South africa, United arab emirates, Ukraine.